The data above includes all known Homo skulls, but none of the results change if you exclude the 24 Neandertals. In fact, you see the same results if you exclude Sapiens but keep Neandertals; the trends are pan-Homo, and aren’t confined to a specific lineage…. This does not mean that I think humanity was inevitable upon earth. For most of the history of this planet life was unicellular. I do not find it implausible that life on earth may have reached its “sell by” date due to astronomical events before the emergence of complex organisms (in fact, from what I have heard the end of life is going to occur ~1 billion years into the future due to the persistent increase in the energy output of Sol, not ~4 billion years in the future when Sol turns into a red giant). But, once complex organisms arose it does seem that further complexity was inevitable. This was Richard Dawkins’ case in The Ancestor’s Tale based simply on the descriptive record. But did the emergence of complex organisms necessarily entail the evolution of a technological species? I don’t think so. It took 500 million years for that to occur (it does not seem that coal resources formed hundreds of millions of years ago were tapped before humans). Given enough time obviously a technological species would evolve (e.g., extend the time of evaluation to 1 trillion years), but note that the earth has only ~5 billion years. Homo arrived on the scene in the last 20% of that interval. One Homo evolved and expanded outside of Africa I suspect that something of the form of a technological civilization became inevitable n this planet. We see parallelism in our own short post-Pleistocene epoch. Multiple human societies shifted from hunter-gatherers to agriculturalists over the past 10,000 years. The experience of the New World civilizations in particular illustrates that human universal tendencies are real. Not only were “game changing” cultural forms such as agriculture and literacy invented independently during the Holocene, but they were not invented during earlier interglacials (at least in all likelihood). Why not? Well, consider the cultural torpidity of Paleolithic toolkits, which might persist for hundreds of thousands of years! I suspect some of this due to biology. But even over the Holocene we do perceive that cultural change has proceeded at a more rapid clip as time has progressed (i.e., at a minimum cultural change has been accelerating, and it may be that the rate of acceleration itself is increasing!). Consider that the civilization of ancient Egypt spanned at least 2,000 years. Though there are clear differences, the continuity between Old Kingdom Egypt and the last dynasties before the Assyrian and Persian conquests is very obvious to us, and would be obvious to ancient Egyptians. In contrast, 2,000 years separates us from Augustan Rome. 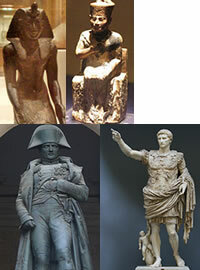 The continuities here are clear as well (e.g., the Roman alphabet), but the cultural change is also clear (if you wish to argue that the early modern and modern period are sui generis, the 1,500 year interval from Augustan Rome to the Neo-Classical Renaissance would still be a stark contrast when compared against an ancient Egyptian reference*, despite the latter’s aping of the forms of the former). So far I have focused on the vertical dimension of time. But there is also the lateral dimension, of cross-fertilization across the branches of the hominin family tree. The admixture of a Neanderthal element into non-Africans has started to become widely accepted recently, thanks to the confluence of archaeology and genomics in the field of ancient DNA. Even if one rejects the viability of Neanderthal admixture, the solution to the conundrum of these results must still entail stepping away from a simple model of recent exclusive origin of humans from a small African population. There are also hints of admixture with other archaic lineages on the Pacific fringe, and within Africa. Until recently it was common to posit that modern humans, our own lineage, had some special genius which allowed it to sweep the field and extinguish our cousins. 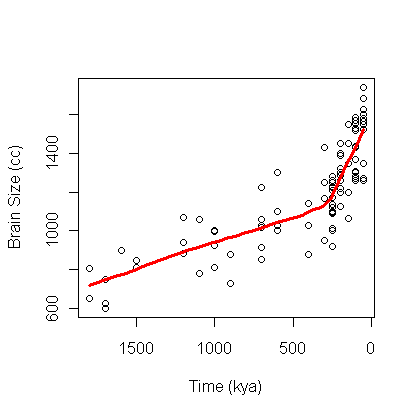 The qualitative result of Luke Jostins’ plot was known; that other hominin lineages also exhibited encephalization. In fact, it was a curious fact that Neanderthals on average had larger cranial capacities than anatomically modern humans. But the reality remained that we replaced them, ergo, we must have a special genius. Until the lack of distinction between Neanderthals and modern humans on loci implicated in the necessary (if not sufficient) competency of language that trait was a prime candidate for what made “us” special. But now I put “us” in quotation marks. The data do point to an overwhelming descent from an African or near-African population for non-Africans over the past 100,000 years. But the “archaic admixture” is not trivial. What was they are us, and we have become what they might have been. For over two centuries there has been a debate in the West between monogenesis and polygenesis. The former is the position that humankind derives from one single pair or population (the former a straightforward recapitulation of the standard Abrahamic model). The latter is the position that different races of humans derive from different proto-humans, or, for the Christian polygenists that only Europeans descent from Adam and Eve (the other races being “non-Adamic”). Echoes of this conflict persist down to the present era. Many of the earlier partisans of “Out of Africa” have claimed that the proponents of multiregionalism were latter-day polygenists (not without total justification in some cases). But the conflict between monogenism and polygenism is not the appropriate frame for what is being unveiled by reality before our eyes. What we see in the creation of modern humanity is a monogenic base inflected with the flavors of polygenism. Modern humans descend, by and large, from an expansion of an African population over the past 200,000 years. But on the margins there are other strands and filaments of ancestry which tie disparate populations back to lineages which branched off far earlier from the main trunk. At a minimum hundreds of thousands, and perhaps an order of 1 million years, before our own age. Today genomics avails of us the statistical power to extract out these discordant signals from the fluid “Out of Africa” narrative, but I would not be surprised if in the near future we stumble upon more and more “long branches” of less noteworthy quantity. Admixture is likely to be an old and persistent story in the hominin lineage, with only the most recent substantial bouts of separation and hybridization being of notice and curiosity at this moment in time. John Farrell has pointed out the possible issues that the Roman Catholic church may have with the new model of human origins. But the Catholic church is only but a reflection of more general human strain of thought. Descent-groups, whether real or fictive, loom large in the human imagination. The evolutionary rationale for this is not too hard to explain, but we co-opt the importance of kinship in many different domains. Like evolution, human cultural forms simply take what is already present, and retrofit and modify elements to taste. So why are humans special? And why do humans have inalienable rights? Many of us may not agree with the proposition that we are the descendants of Adam and Eve, and therefore we were granted the divine grace of eternal souls. But a hint of this logic can be found in the assumptions of many thinkers who do not agree with the propositions of the Roman Catholic church. Recently I listened to Sherry Turkle arguing against a reliance on “robot companions” which are able to exhibit the verisimilitude of human emotions for those who may be lacking in companionship (e.g., the aged and infirm). Though Turkles’ arguments were not without foundation, some of her arguments were of the form that “they are not us, they are not real, we are real. And that matters.” This is certainly true now, but will it always be? Who is this “they” and this “we”? And what does “real” mean? Are emotions a mysterious human quality, which will remain outside of the grasp of those who do not descend from Adam, literal or metaphorical? If there arises a point where non-human sentience is a reality, do they have the same rights as we? Though the difference is radical in terms of quantity to some extent I think we know the answer: they are human by the way they are, not by the way their ancestors were. 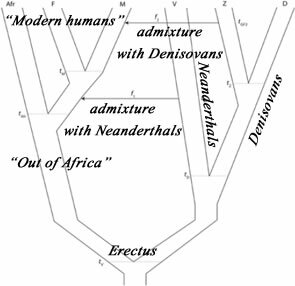 The “taint” of admixture with diverse lineages across the present human tree of life has not resulted in an updating of our understanding of human rights. That is because the idea that we are all the children of Adam, or the descendants of mitochondrial Eve, is a post facto justification for our understanding of what the rights of humanity are, adn what humanity is. And what it is is a particular ecological niche, a way of being, not being who descend down in a line of biological relationship from a particular person or persons. * The cultural fundamentals of Old Kingdom Egypt arguably persisted in a living fossil form in the temple at Philae down to the 6th century A.D.! Therefore, a 3,500 year lineage of literature continuity. 5 Comments to "The Sons of Adam: Spirit, Not Blood"
You won’t see culture in the genetic record as phenotypic differences. Once humans had the capacity of speech, of inheriting not only (almost exclusively) via genes, but when culture started to become another important pathway of heritage, you could imagine having different linages of humans with exactly the same phenotypic traits (cranial size, ability to speak, etc.) 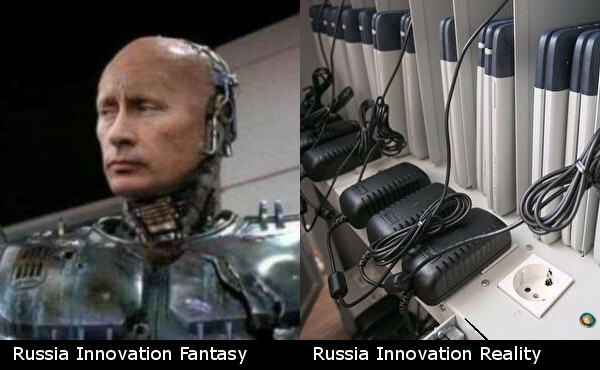 but different cultural heritage and therefore different cultural abilities. The genetic differences in these two lineages of humans (with different cultures) would arise in parallel with the culture, and they would be correlated but have no causative relation. So is it culture that makes us human? But can we be humans without our genetic heritage? Since culture is the disembodied transmission of information, it would have been possible for the different human lineages to transfer information laterally, i,e. to learn from each other (and I believe the archaeological record does show overlap between Neanderthal and Modern cultural remains, though this is generally interpreted in favour of the Moderns). Literacy is a further step change in the transmission of information, hence the acceleration of cultural change. Arguably as a result of literacy, we’ve had the unification of the earth, our environment, through exploration, including deep sea navigation. That allowed the body of scientific knowledge to be filled in – and perhaps, like doing a jigsaw, this has proceeded faster and faster as the picture has emerged. To take the periodic table as an example, some of the elements are found only in particular deposits around the world, and couldn’t have been assembled without global travel. Shades of Cordwainer Smith. You write very poetically at times, Razib. It takes me days to collect my thoughts and so my comments are often the last ones posted. 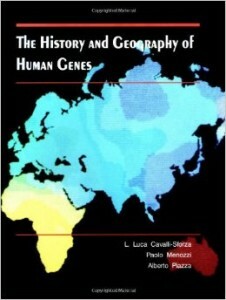 In response to Razib’s comment “until recently it was common to posit that modern humans, our own lineage, had some special genius which allowed them to sweep the field and extinguish our cousins.” I know you are referring correctly to the Out of Africa theory that has recently been proven incorrect. But later, aproximately 65,000 years ago there is a genetic indication of a population bottleneck of as few as 10,000 of our direct ancestors that occupied the planet. I never bought the theory that this population bottleneck was caused by disaster such as the Sumatra super volcano, I have always thought it illogical that mankind would verge on the cusp of extinction right when we were bordering on full modernity. I think the reason for the small population was that was this population bottleneck was the point in time when we developed some special genius which allowed us to sweep the field.